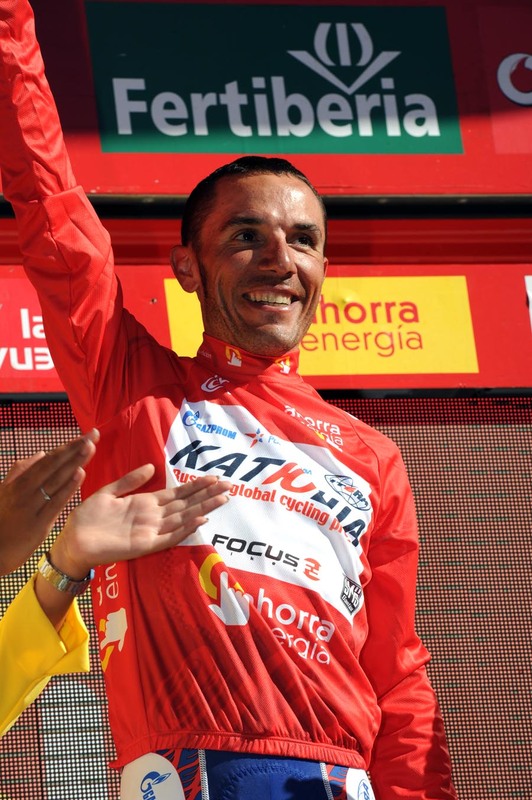 Climbing powerhouse Joaquin Rodriguez (Katusha) won the eighth stage of the Vuelta a Espana on Saturday – his second stage win of the 2011 race. Rodriguez rode away from the favourite’s group, just as he did on stage five, to take the win and the overall lead of the race. Michele Scarponi (Lampre-ISD) had tried to match Rodriguez’s pace on the climb in San Lorenzo de El Escorial and clung on for second place at nine seconds. Bauke Mollema (Rabobank) placed third at the same time. Rodriguez and Katusha team-mate Daniel Moreno now occupy the top two positions overall, with Jakob Fuglsang (Leopard-Trek) in third. British Sky pair Chris Froome and Bradley Wiggins stayed in touch with the favourites to move up to 19th and 20th overall, both at 1-43. With three categorised climbs on the day’s route, several groups of riders fancied their chances for an escape group early on. A flurry of attacks was met with some stiff opposition for the bunch, with Movistar and Liquigas both playing an active role in reeling in escape groups containing any threat to the overall classification. Heinrich Haussler (Garmin-Cervelo) and Matteo Montaguti (Ag2r) eventually broke free from the bunch’s clutches and were later joined by Adrian Palomares (Andalucia Caja Granada) and one of Friday’s breakaway riders, Julien Fouchard (Cofidis). Montaguti crested the category one climb of Puerto de Mijares first, before the riders headed downhill. Two second category climbs then had to be tackled before the finish – Alto de San Bartolome and Alto de Santa Maria. Koen De Kort (Skil-Shimano) attempted to bridge up to the lead quartet, but after an extended spell in no-man’s land was caught by the peloton. Perhaps paying for his efforts the previous day, Fouchard lost contact with his three escape companions on Alto de Santa Maria. Katusha worked hard to whittle down the break’s advantage at the front of the bunch, no doubt mindful of setting up good stage finish for Daniel Moreno and/or Joaquin Rodriguez to grab some crucial bonus seconds. Martin Kohler (BMC Racing) and Amets Txurruka (Euskaltel-Euskadi) attacked the bunch with 25km to go, causing Katusha to wind up the pace again. Txurruka dropped Kohler, and attempted to bridge to the break solo but his small frame didn’t lend itself to catching the escapees on the downhill. It was all to no avail as the break was caught with 12km to go as Rein Taaramae (Cofidis) attacked the bunch. 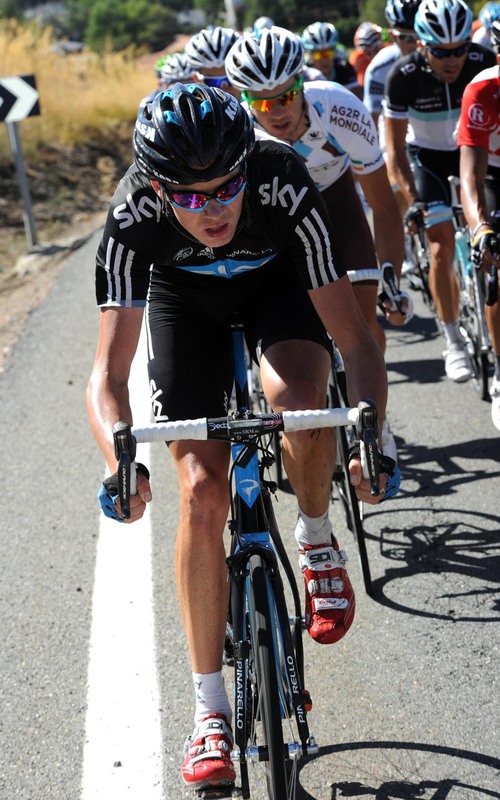 The Estonian’s move inspired several further attacks, as Angel Madrazo (Movistar) caught and passed him. As the bunch reached the bottom of the final, brutally steep San Lorenzo de El Escorial climb all escapees were caught setting up a showdown for the favourites. As the road reared up to 20 per cent, stage five winner Rodriguez launched his move, distancing Michele Scarponi (Lampre) and Jurgen Van Den Broeck (Omega Pharma-Lotto) and taking Katusha’s third win of the race. Sylvain Chavanel (Quick Step) could not keep with the pace on the final climb and finished over a minute adrift of Rodriguez to lose the overall lead. Bradley Wiggins (Sky) finished in 19th place, 20 seconds behind Rodriguez and keeps his 21st place overall at 1-43. Defending champion Vincenzo Nibali (Liquigas) was one of those riders who was distanced on the final climb, losing 32 seconds to Rodriguez and slipping to fourth overall. Irish pair Nicolas Roche (Ag2r) and Daniel Martin (Garmin-Cervelo) rode well to place seventh and ninth on the stage. There were several notable non-starters and withdrawals during the stage. After yesterday’s finish-line crash, both Michal Golas (Vacansoleil) and Tyler Farrar (Garmin-Cervelo) withdrew from the race due to their injuries. Spaniard Oscar Freire (Rabobank) also quit the race. It’s another tough day in the mountains on Sunday, with a mountain-top finish to give the overall contenders something to think about before Monday’s decisive individual time trial stage.